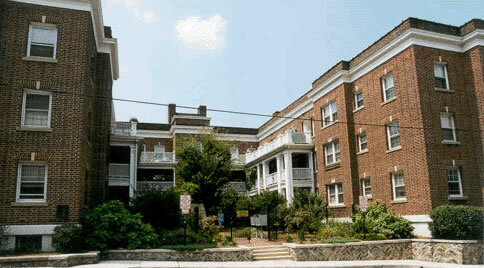 Carolina Apts.- 68 N. French Broad Ave.; 3BR/1BA; $1275/mo. The grand and glorious Carolina has been restored to its original Southern charm, just as it was in the 1920s. Completely restored in 1995, the Carolina retains its original hardwood floors and incredible city or mountain views, but features all new plumbing and wiring, natural gas heat, central air, and fully-equipped kitchens. Large, airy apartments. Parking in city lots available. Tenant pays gas, electric, water/sewer, and parking. First floor apartment featuring a bonus room next to kitchen. NO dogs, cats only with pet fee. No co-signers. Directions: From downtown Asheville, I-240W to Montford Ave exit, turn left across interstate bridge, left on Haywood St., right on N. French Broad; Carolina is on right corner (3-story), U-shaped red brick building with landscaped courtyard and wrought iron fence). 47 Albemarle Road; 2BR/1.5BA; $1075/mo. Townhouse-style 2BR/1.5BA condos; understated stone and cedar units blend beautifully w/ their surroundings and are located in the highly desirable Manor Grounds neighborhood. All units feature LR w/stone fireplace and glass fronted wood stove insert, large eat-in kitchen, w/d connections, and half bath downstairs; deck off of kitchen. Two large BRs and full bath upstairs. Floors are carpet/vinyl. Parking in front of building. Stone FP w/ wood insert. Central air. Townhouse. Tenant pays: sewer, water, electric. Landlord pays: garbage. Pets OK w/ approval/deposit. Asheville City Schools. No co-signers. Directions: Charlotte St. north (toward Grove Park Inn); right on Cherokee Rd., right on Orchard St., 1/8 mile on left. Carolina Apts.- 68 N. French Broad Ave.; 2BR/1BA; $1015/mo. The grand and glorious Carolina has been restored to its original Southern charm, just as it was in the 1920s. Completely restored in 1995, the Carolina retains its original hardwood floors and incredible city or mountain views, but features all new plumbing, wiring, and mechanicals, natural gas heat, central air, and fully-equipped kitchens. Large, airy apartments. Great mountain views. Laundry facilities and coded access. Parking is not provided; tenants must make their own parking arrangements. No dogs, cats only on approval with pet fee. No Co-signers. First floor unit. Directons: From downtown Asheville, I-240 W to Montford Avenue exit, turn left across interstate bridge, left on Haywood Street, right on N. French Broad; Carolina is on right corner (3-story), U-shaped red brick building with landscaped courtyard and wrought iron fence.